What is average salary in Boston? Based on our survey (556 individual salary profiles) average GROSS salary in Boston is US$ 92,664. Average NET salary is US$ 68,134. The most frequent GROSS salary is US$ 52,939. The most frequent education is Bachelors Degree. The most frequent experience are 20+ Years. Below is the list of 556 individual salary profiles - all added on this website. Some College, 20+ years: "Personnel in recruitment and placement, and position management." Bachelors Degree, 20+ years: "C#, SQL, WCF, managing"
Bachelors Degree, 20+ years: "manage projects"
Masters Degree, 4-8 years: "Nonprofit fundraiser"
Bachelors Degree, 20+ years: "criminal investigation"
Some College, 20+ years: "Responsible for the Release Engineering and Technical Documentation for a Software Development company. Project and Program management Coordinate interactions and information flow between all Engineering groups and Operations groups." Some College, 20+ years: "utility workers"
Bachelors Degree, 4-8 years: "Auditing IT systems"
Bachelors Degree, 8-12 years: "Write and maintain PHP code." Bachelors Degree, 20+ years: "Founder and CEO of a Cloud Software company"
High School, 20+ years: "Sales manager area"
Doctorate Degree, 20+ years: "college teacher"
Bachelors Degree, 16-20 years: "Tech lead on a 10 person team"
Bachelors Degree, 2-4 years: "Generate sales lead"
High School, 8-12 years: "I make sure every project is underway and on time. We keep a tight schedule"
Masters Degree, 4-8 years: "I work with gyroscopes and test them"
Masters Degree, 16-20 years: "Maximize the value of a portfolio of commercial real estate assets owned by a private equity fund." High School, 2-4 years: "manufacturing worker"
Some College, 20+ years: "Business Analyst working with Scientist to understand and document software requirements"
Masters Degree, 20+ years: "Lead team of staff and direct labor workforce to manufacture goods safely, on time and on budget while meeting or exceeding the quality standards for the product." Masters Degree, 20+ years: "Software developer and then management." Masters Degree, 20+ years: "Healthcare executive administrator finance reporting analysis"
Masters Degree, 1-2 years: "staff accountant"
Masters Degree, 8-12 years: "Client discussion"
Bachelors Degree, 12-16 years: "Team Management, Project Management, Marketing, Analytics"
Masters Degree, 12-16 years: "Architecture design"
Doctorate Degree, 8-12 years: "internal medicine doctor"
Some College, 20+ years: "to protect and serve"
Bachelors Degree, 20+ years: "Engineer Engineer Engineer"
Bachelors Degree, 8-12 years: "Daily activity, Financial statements"
Bachelors Degree, 2-4 years: "call escalations, training, reporting, quality control, networking, collaboration, supervising"
Some College, 20+ years: "Manage projects"
Bachelors Degree, 20+ years: "Analysis of blood and other body fluids"
Bachelors Degree, 4-8 years: "recruiting, hiring, on boarding, benefits, compensation, leading"
Masters Degree, 8-12 years: "• Lead and Direct the Facilities Maintenance organization to ensure that all facilities are in compliance with all applicable codes and regulations to maintain a safe environment. Advise on effective use of physical resources to improve operational efficiency. • Lead, motivate and develop the facilities team, prioritize work and allocate resources in order to ensure results are delivered in line with business objectives. • Monitor and control allocated human and material resources, maintaining financial and progress forecasting in order to ensure the day to day operation of National Grid's facilities are delivered according to schedule and within budget. • Establish key performance targets to optimize business performance in line with Nation Grid strategic Priorities. • Leads the development and administration of the O&M budgets. Participates in annual budget estimates, and works with jurisdictional presidents to identify present and future maintenance/technical needs for the properties. • Provide oversight and leadership in implementing contractual requirements and service level agreements in order to meet service specifications and deliver against facilities business objectives. • Attend meetings with company leadership, union officials, local, county and state agencies to ensure National Grid facilities continue to run efficiently and safely." Masters Degree, 20+ years: "Hatchery and Fish Farmer for marine species"
Masters Degree, 12-16 years: "Manage project scope, budget, resources, schedule." Masters Degree, 20+ years: "20+ years spent in finance and professional services establishing controls and processes to support multi-national companies." Masters Degree, 8-12 years: "Regulate clinical trials. Read, and review scientific protocols"
Doctorate Degree, 20+ years: "Research and advice regarding business practices of various small businesses"
Bachelors Degree, 4-8 years: "Recruitment, Sourcing, Interviewing"
Bachelors Degree, 20+ years: "requirements & risk management"
Bachelors Degree, 8-12 years: "Negotiate clinical research contracts and budgets with institutions conducting studies." Masters Degree, 8-12 years: "consultant for financial services"
Some College, 20+ years: "IT related management of 16 man team"
Bachelors Degree, 20+ years: "I with the help of my wife and partner oversee a staff of 32 including chef, cooks, waitstaff, bartenders , and dishwashers. We take reservations, book parties, advertise, purchase goods, do payroll, prices, menu changes, wine list etc. In other words everything gets our attention." Masters Degree, 4-8 years: "I help students and teachers. I don't have my own classroom and I don't have any prep work or grading. I work 35 hours a week, 183 days a year and have all of the summer and other vacations off." Bachelors Degree, 20+ years: "Analyze requirements, architect/design solution, code, debug, training"
Masters Degree, 4-8 years: "direct mail, email marketing, budget management, creative concepts, event planning....segmentation, profiling, marketing plus sales"
Doctorate Degree, 2-4 years: "Synthetic organic chemist working in pharmaceutical industry"
Doctorate Degree, 4-8 years: "postdoc researcher, have 5 years research experience"
High School, 20+ years: "get people to stop being in jail because that is not any fun or fair." Masters Degree, 20+ years: "Managing bank demand deposit systems"
Doctorate Degree, 1-2 years: "Postdoctoral fellow. Research and development. Data analysis. model development. Energy analysis"
Masters Degree, 8-12 years: "Head of Non Government Organization"
Some College, 0-1 year: "Intern tasks within strategic Analytics team"
Bachelors Degree, 8-12 years: "Creating brick and mortar store presentations. Including product set up, windows, and marketing." Bachelors Degree, 1-2 years: "Medical Surgical- Med Surg in a magnet Hospital in rural MA. 3 yrs experience." Bachelors Degree, 12-16 years: "Research the wealth capacity of alumni." Doctorate Degree, 20+ years: "I handle employee issues, including salaries, health insurance, and discipline"
High School, 12-16 years: "testing of virus definitions within the united states"
Masters Degree, 20+ years: "escalations, troubleshooting, problem solving"
Bachelors Degree, 0-1 year: "I am a consulting analyst within the field of TMT"
Bachelors Degree, 4-8 years: "Oversight of partnered groups, sales teams and competitive research"
Bellow H. School, 20+ years: "Oversee project progress and scheduling"
Bachelors Degree, 2-4 years: "software developer, java applications"
Bachelors Degree, 0-1 year: "Complete 1040's for clients, usually residents or small businesses"
Bachelors Degree, 20+ years: "wireless management and billing"
Masters Degree, 8-12 years: "lead engineering team and develop strategy"
High School, 1-2 years: "I fix aircraft for the military." Masters Degree, 8-12 years: "product marketing intern, associate manager, part time"
Bachelors Degree, 4-8 years: "Research Associate - R&D Pharma"
Some College, 2-4 years: "travel Consultant, specializing in European destinations"
Masters Degree, 20+ years: "consultant for businesses and organizations"
Masters Degree, 8-12 years: "Grant administrator: manage a portfolio of federal and private sponsored research awards." High School, 0-1 year: "I help doctors around the office. I take BP, blood, get the symptoms of the patient. I also do receptionist work." Bachelors Degree, 8-12 years: "CPA Working for 12 years in boston"
Bachelors Degree, 8-12 years: "research different solutions to fix the problems"
Masters Degree, 12-16 years: "i am a math teacher who teaches math to kids every day"
Bachelors Degree, 20+ years: "Network and telecomunication Engineer"
Bachelors Degree, 2-4 years: "Security Auditing & Compliance, Security Analysis, Management"
Masters Degree, 12-16 years: "Partner with clients to create content that resonates with pivotal consumers including articles, press releases, social media and email campaigns. Build effective relationships with key media. Train and supervise associates and interns." High School, 1-2 years: "i am the waiter at a seafood restaurant"
Bachelors Degree, 8-12 years: "Teach English in a high school." Masters Degree, 20+ years: "Math and Special Ed in High School"
Masters Degree, 8-12 years: "Director of Business, Director of Human Resources"
Masters Degree, 12-16 years: "Procurement Manager for a Technology Company"
Bachelors Degree, 8-12 years: "Dir. MArket Intelligence overseeing workforce trends related to regulations and supply/demand analysis"
Bachelors Degree, 16-20 years: "general manager fast casual restaurant"
Bachelors Degree, 2-4 years: "Clinical research coordinator at an academic teaching hospital." Some College, 4-8 years: "Business owner with ride sharing company"
Bachelors Degree, 20+ years: "Director of Sales with 14 direct reports and 80 indirect reports"
Bachelors Degree, 20+ years: "COO at 30 person SaaS Software Company"
Doctorate Degree, 4-8 years: "Senior corporate counsel (M&A, finance)"
Bachelors Degree, 1-2 years: "A University Research Assistant"
Bachelors Degree, 0-1 year: "Audit Associate at PricewaterhouseCoopers"
Page 1 of 6, 100 of 556 salary profiles. The 4 largest industries among Boston's employers are health care, financial services, insurance, and education. The health care industry in Boston employ far more employees than any other sector. More than 50% of Boston’s employees at largest companies have at least a four year college degree. The 4 largest employers in Boston are Massachusetts General Hospital, Brigham and Women's Hospital, Fidelity Investments (FMR Corp., and Boston University. 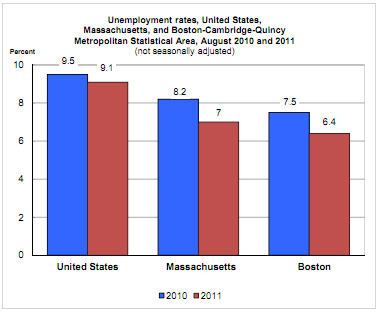 Average salary in Boston is much higher than national average salary. For example Senior Software Developer in Boston earn around $95,000 on average per year. Executive Assistant earn around $54,000 on average per year.